Nearly everyone of note in the Steampunk community has tried at one time or another to define what Steampunk is, myself included. Every time someone tries, it's met simultaneously with both backlash and support for either being too open or too closed. Half of the people seem to want Steampunk to be free and open (the it-can-be-whatever-you-want crowd) and the other half want it to be rigid and defined (the without-a-definition-it's-meaningless crowd). Both feel like the other side is somehow infringing upon their enjoyment of Steampunk, but I'm here to tell you that it doesn't matter which side you believe. The important part is being able to effectively and accurately express yourself through the clothes you wear, and I'm going to teach you how to do that! If we're talking about fashion, we're clearly concerned specifically with the Steampunk aesthetic for the purpose of this article. So what is the Steampunk aesthetic? 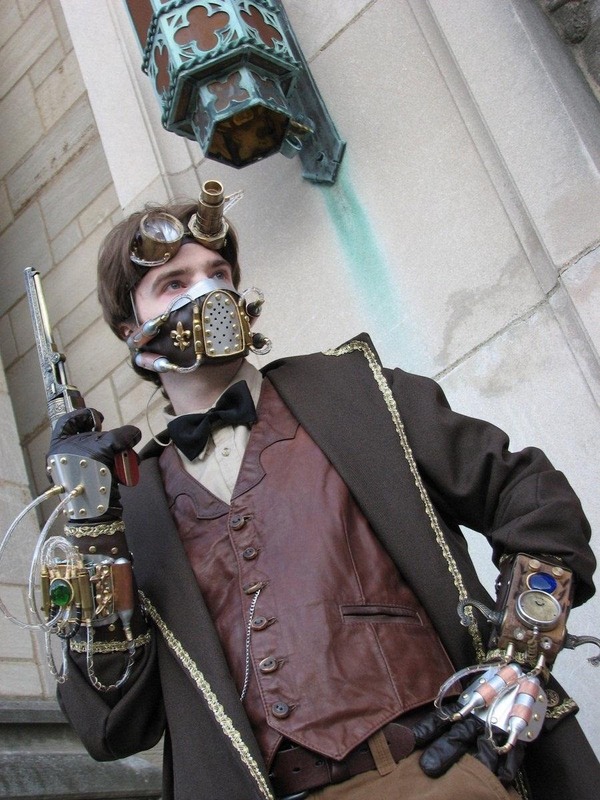 If you self-identify as a Steampunk, or just want to give it a try, how do you make sure that your outfit expresses that? Considering how broad Steampunk is, stylistically, it's nearly impossible to define the aesthetic in any real, concrete terms unless you just start throwing words out there like "brown", "gears", "corsets", "vests", and the like, though of course not every Steampunk outfit has a corset or vest, or is even brown. So we're left with the oft-misattributed ruling on obscenity by United States Supreme Court Justice Potter Stewart: "I'll know it when I see it." Well, that's just not very helpful to anyone, is it? A visual cue is something that calls a specific image, feeling, sound, or thought to mind when it's seen. Fashion draws on a variety of visual cues to summon something in the viewer, and Steampunk is exactly the same way. Most of us do this subconsciously every day when putting together an outfit for school, work, or play. Very few of us choose any given outfit based entirely on functionality, but instead choose based on a combination of functionality and looks, or in some cases just looks. When the proper combination of visual cues come together, an outside viewer will recognize an outfit as Steampunk. It's not a set collection of cues, but rather if you combine several out of the many different options, you'll hit the target. Let me break it down even further in order to try to make my point. What I'm going to do is assign each cue a numerical value (out of 100), and that value represents how likely it is that someone will think "Steampunk" when they look at it. As I said, there's no single item that will do the job on its own, so I wouldn't rate any single object at more than, say, 50. Bear in mind that these numbers are somewhat arbitrary, and are intended to make a point rather than to be taken at face value. So, as an example, let's say that you wanted to put together an outfit that people would recognize as Steampunk, and let's say that a score of 100 is sufficient to pass the recognition threshold for most people. In order to reach that point, you have to combine the objects above until you've gotten a score that's more than 100. So, say, goggles and a top hat will be Steampunk for people. Or a corset, a bustle, and goggles. I understand that this may be confusing, but bear with me and I'll give a concrete example. It's important that you begin to think about this process consciously, though, in order to be able to successfully express yourself in a purely visual medium. The best example I can give is slightly self-aggrandizing, but I beg your indulgence! 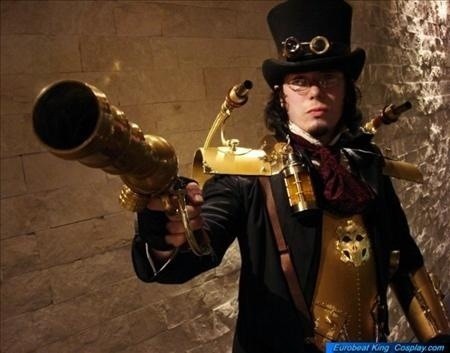 Nearly everyone in Steampunk is familiar with the role that Nerf has taken in our subculture. Many Steampunks get their start making props by painting a Nerf Maverick, and some go on to paint or mod bigger guns, such as the Vulcan cannon. The idea is to make these plastic guns look like real metal and wood. 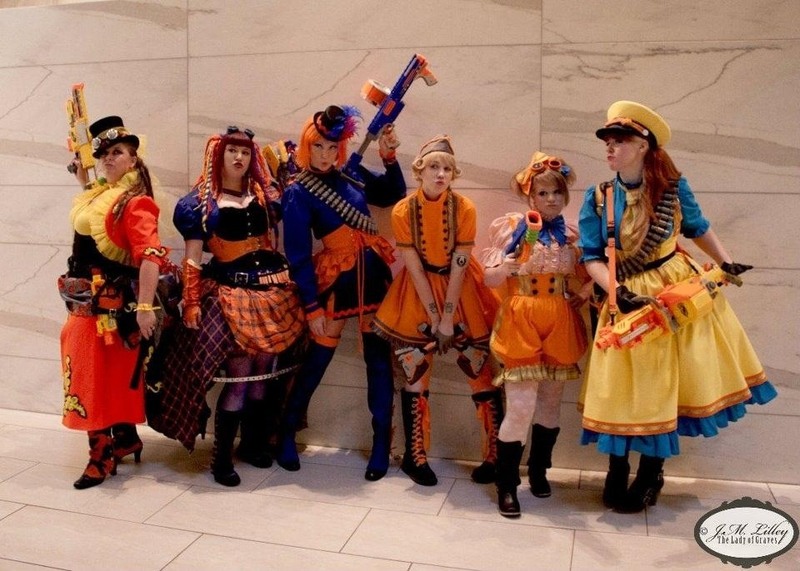 Well, my wife and I were sitting around one day when we decided that it would be funny to do it the other way around; that is, make Steampunk outfits in the neon yellow and orange Nerf colors. When designing the outfits, we had to think very carefully about them. How could we make people understand the idea behind the outfits by sight alone when they were going to be the total opposite of the traditionally-accepted Steampunk colors? Note how nearly all of them have, if not a full corset, then a waist cincher of some variety. Going from left to right, let's look at the specific details that read to a viewer as Steampunk. The one on the far left has a short, bolero-style jacket that was popular in the Victorian era, and has decorated it with ruffles. Ruffles were a sign of opulence in the Victorian era, because fabric was expensive and ruffles used more fabric. Additionally, note the spats on her boots, and the decorative details on her sleeve and skirt. I'll draw your attention to the next woman, now. Look at her cage skirt, cincher, goggles, gloves, and hair falls. All of these are common Steampunk items which have become visual cues to an observer. The next lady has a mini top hat, a bustle (which you can only kind of see in this picture), and a very old-fashioned blouse with puffed sleeves. These are combined with a short skirt and tall boots to achieve an anachronistic style. The fourth woman is wearing a more Dieselpunk-style outfit, but the military-inspired double buttons and garrison cap clash incongruously with her short skirt and laced boots, again combining to create that feeling of being out of place in history. The fifth woman is wearing high-waisted bloomers, a very ruffly shirt, with goggles on her head as a hair accessory. There's a very Victorian influence in the outfit, but it's tempered by that flair of, well, punk. And lastly, the final woman (who is my wife, and co-creator of Nerfpunk) is wearing a longer dress that's actually a jumper skirt with an exaggeratedly large tie combined with gloves, a bandoleer, and an officer's cap. The point here is that each outfit has a lot of details. As you saw in the above picture breakdown, the outfits all combined historical and fantasy elements to look Steampunk even without the traditional browns. Generally speaking, that's how one achieves a Steampunk look: by giving an outfit the air of the past without actually being historically accurate at all. Let me repeat that, just in case it wasn't clear: Steampunk is not at all about being historically accurate. 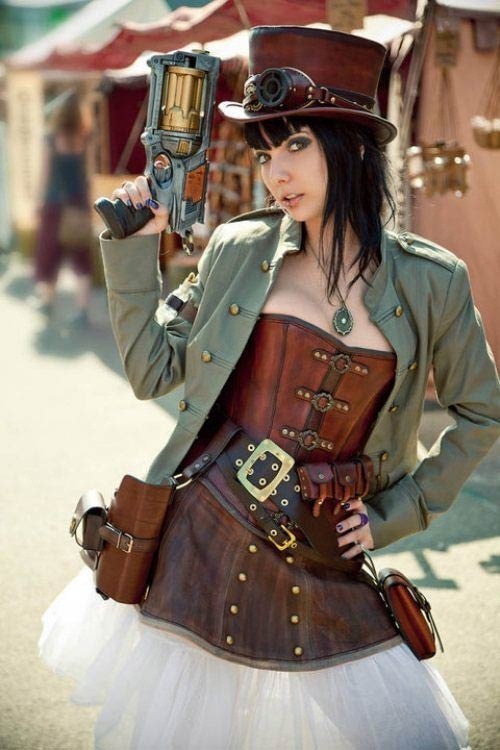 The most effective Steampunk outfits use the feeling of the past instead of the real past. When putting together a Steampunk outfit, try to focus on the details. It may or may not help you to think of it in terms of numbers, but consider whether the various accessories or details you're using combine to provide the correct impression to those who will see you. The best way to accumulate a mental database of appropriate details is to look on the internet. Do a Google search for Steampunk. Browse Steampunk communities. Keep your eyes open, and when you see an outfit that you like, examine the details. Ask yourself what you like about the outfit, and how it accomplished the look it achieved. It might even help to keep a list, or an image folder, that you can consult in the future if you think your outfit is lacking. This might sound like common knowledge, but you'd be amazed at how often we look at things without really seeing them. Make an effort to notice the details, and you'll be amazed at the things you missed before! Now go forth and make awesome outfits!